This past May, Gordon Ramsay opened up his first Sin City restaurant, and big surprise, it's a steakhouse, because that's just what they need more of in Vegas. 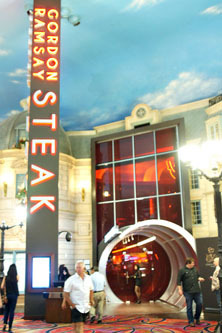 The $5 million spot, housed at the oft-ignored Paris, bowed right before the start of Hell's Kitchen Season 10, and marketing materials proudly proclaimed the restaurant as a showcase for the angry Chef's "fury for flavor" (seriously, that's the tagline). Naturally, the timing of the debut wasn't coincidental, as the winner of the TV show was billed as receiving a $250,000/year "head chef" position at the steakhouse. When the dust settled, Philadelphian Christina Wilson reigned supreme, handily defeating Justin Antiorio in the finale. She started work at the restaurant on September 12th, but of course we all know that "head chef" really translates to a glorified sous, so it's Executive Chef Kevin Hee who actually runs the show. About the Chef: Chef Hee hails from Honolulu, Hawaii, and is a graduate of Kaiser High School (class of 1996). He enrolled at the University of Hawaii at Manoa as a business major, but soon realized that his true calling was in the restaurant industry. As such, he began working for noted Hawaiian chef/restaurateur Sam Choy while in college, and following his tenure at UH, found his way across a number of restaurants on Oahu. Hee eventually hooked up with Michael Mina, working at his various properties before relocating to Las Vegas to become Executive Sous Chef at Mandalay Bay's Stripsteak in August of 2007. The following March, he transitioned to a similar role at Nobhill Tavern at the MGM Grand, and even worked a stint at Mina's eponymous restaurant at the Bellagio. 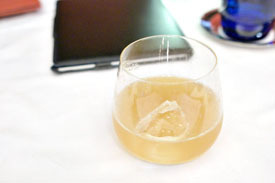 In 2010, Hee moved to Motor City to take the reins at Mina's Bourbon Steak and SaltWater, both at the MGM Grand Detroit, a position he would hold until decamping last year. 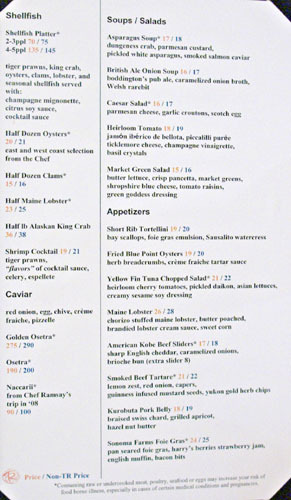 The front-of-the-house, meanwhile, is the task of General Manager Jean-Philippe "JP" Teresi, who previously headed up operations at The Range Steakhouse at Harrah's. Before that, he worked at Sugar Factory at Paris, Bradley Ogden at Caesars Palace, as well as Charlie Palmer Steak and Cafe Boulud, both in New York. Note that he is a different Jean-Philippe than the maître d' on Hell's Kitchen; that would be Jean-Philippe Susilovic. GR Steak takes over the site of the former Les Artistes Steak House, a somewhat middling joint that shuttered on January 2nd. Following a complete renovation by San Rafael firm EDG: Interior Architecture and Design, the restaurant now features a whopping 274 seats, and is spread out across a main dining room, private dining room, chef's table, and separate bar/lounge. The kitchen, natch, is on proud display via an open layout, and there's even a mezzanine dining area up top. Of particular note is the ginormous Union Jack emblazoned on the ceiling, which was incorrectly painted initially. 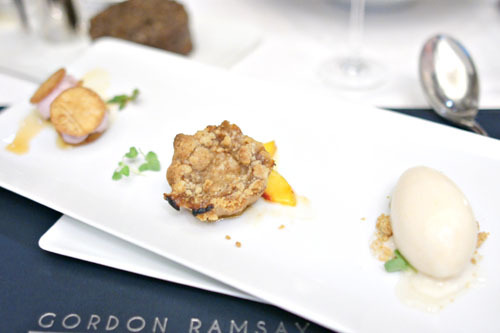 The Gordon Ramsay Steak menu offers up prototypical steakhouse fare, with perhaps a bit of British flair thrown in for good measure. 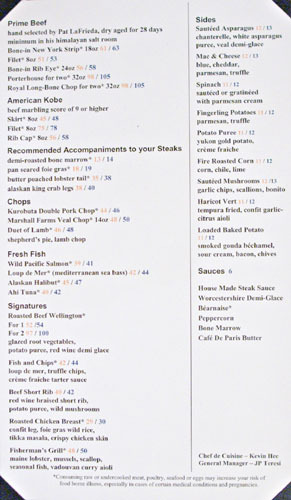 Of note is the beef aging program, featuring dry-aged cuts ostensibly selected by the legendary Pat LaFrieda and rested for a minimum of 28 days in his "Himalayan salt room." 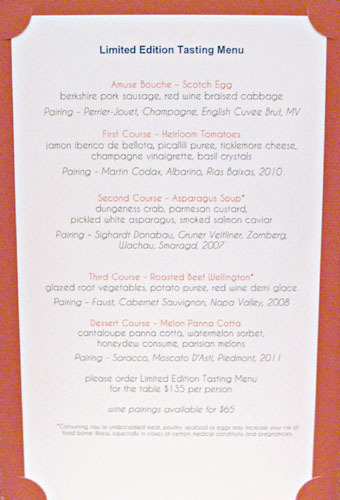 A five-course Limited Edition Tasting Menu is also available at $135pp, and includes a signed photo of Chef Ramsay. Click for larger versions. 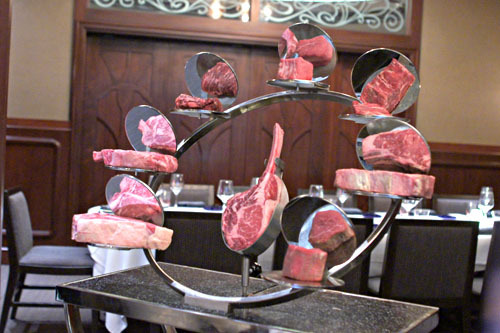 Gordon Ramsay performs the pre-dinner, tableside presentation of meat made popular by CUT, but takes things up a notch with the inclusion of a mirrored pedestal for the steaks. 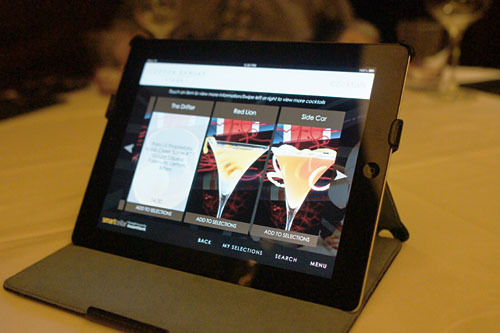 The beverage selection, meanwhile, is housed on an iPad running Incentient's SmartCellar software. We started things off with a few cocktails to share 'round the table. The Drifter was our favorite of the bunch, really showing off the character of the custom Knob Creek but layering on top of it a good balance of citric and sugary notes. 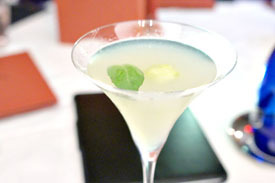 Meanwhile, the English Garden was completely different, with a very vegetal, herbaceous tartness that worked well enough over its base of gin, though I would've liked a bit less celery. 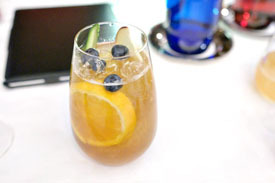 The easiest-drinking libation here was the Pimm's Cup, a fairly traditional presentation of the liqueur, with a light, fruity, spicy flair that made it a perfect summer-y cocktail. 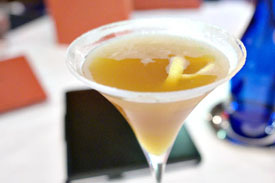 On the other hand, The Sidecar was much stiffer, but nevertheless enjoyable, with a tasty amalgam of sweet, smoky, and bitter flavors, and brightened up by the citrus-y overtones from the lemon. A plate of bread was subsequently placed on our table. 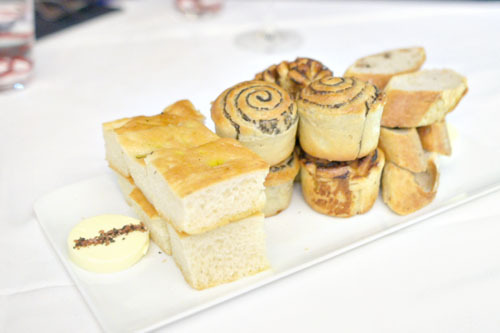 Lemon-thyme-olive oil focaccia, roasted pancetta, mushroom-truffle, and Stilton-walnut varieties were offered, all served with an English Devonshire sea salt butter. 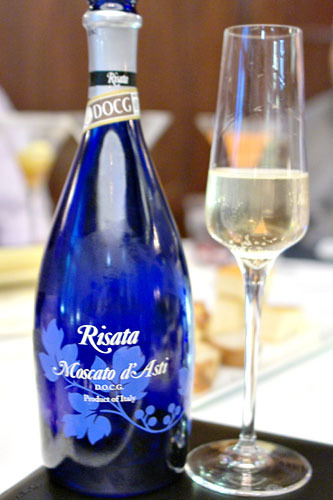 With our cocktails dispensed with, we wanted to go with a fun, gluggable wine, and thus ordered up a bottle of Moscato d'Asti, specifically the 2011 I.V.I.S.p.A.-Canelli Moscato d'Asti Risata [$47]. That perhaps wasn't the best choice, as it was very sweet, too much so in fact, and we would've been much better off with something dryer. Nothing wrong with the wine per se; it was just the wrong decision here. The name "Market Green Salad" on the menu didn't exactly inspire confidence, but the dish turned out to be a pleasant surprise. I really enjoyed the crispness and lightness of the greens here, and loved the salty, crunchy exclamation point provided by the pancetta. 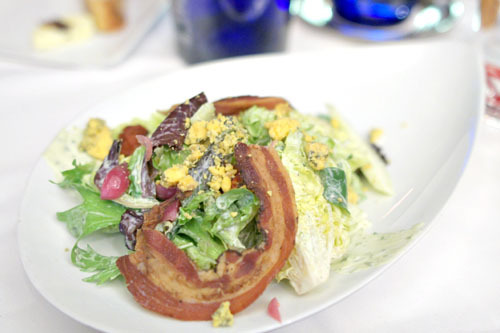 At the same time, the use of blue cheese imparted a certain weight and piquancy to the salad, while the creamy, tangy green goddess performed wonderfully in tying everything together. 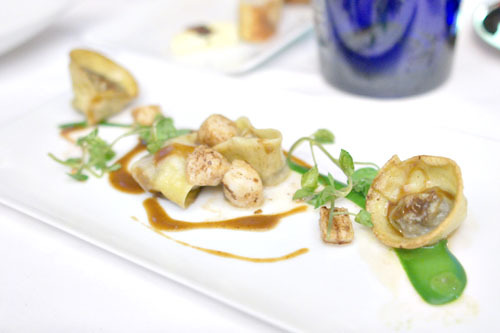 Tortellini were as delicious as you'd expect, with the deep, dark flavors of the tender short rib dutifully augmented by the notes of foie gras in the course, while the watercress provided just a touch of countervailing pepperiness. Scallops seemed like a somewhat odd addition, though I did like them as another point of interest in the dish. Quite nice--I could've eaten a big bowl of the stuff. 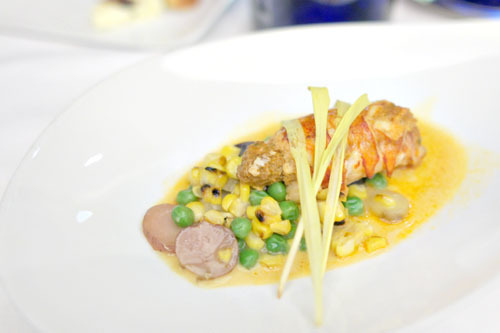 A tail of lobster was a touch over, but still showed off a pleasing savor, with a lovely saline sweetness that was deftly enhanced by the corn. I also appreciated the accompanying cream sauce, which did a great job in integrating all the various elements on the plate together. 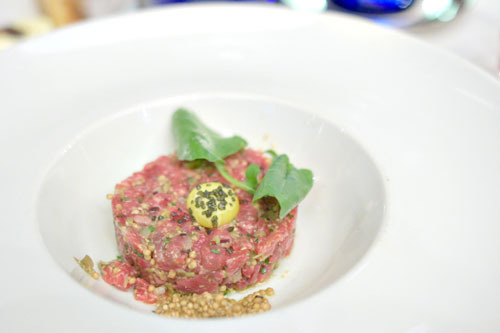 The classic steak tartar was revamped slightly here with impressive results. Texturally, the meat was spot on and satisfying, certainly beefy in essence, but also adroitly tempered by the tanginess of the accompanying mustard, capers, and onion. 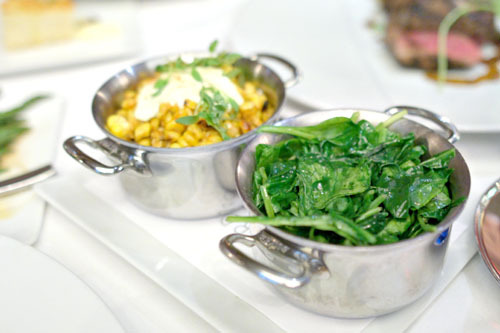 The whole dish was eminently balanced, an expertly crafted take of a steakhouse mainstay. 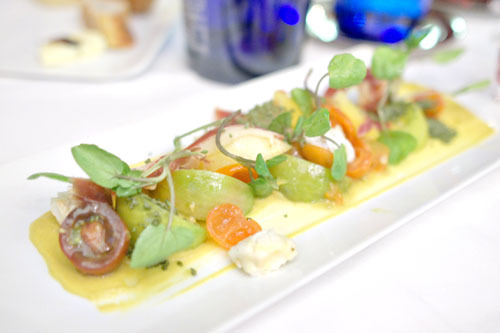 The ubiquitous heirloom tomato salad was taken up a level by the incorporation of jamón ibérico, which lent an enveloping veil of salty, rich, fatty goodness that keenly imparted a sense of depth and weightiness to things. I also enjoyed the tomatoes themselves--sweet, succulent, and juicy--and their range of textures and forms, while the Ticklemore and piccalilli imparted further complexity to this surprisingly multifaceted dish. 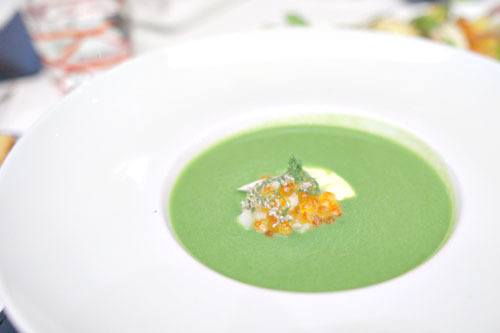 Rounding out our appetizers was a delightful asparagus soup, one that really did a commendable job expressing the pure, verdant character of the vegetable. At the same time, the Parmesan added depth and body to the dish, and the combination of salty ikura and sweet crab made perfect sense. 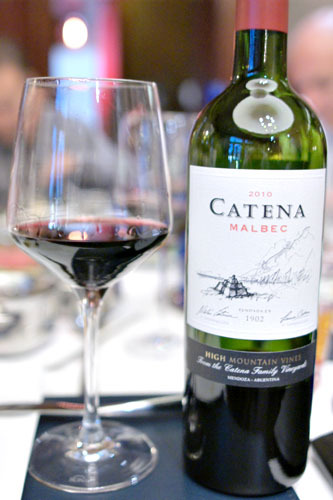 To pair with the steak, we went with a bottle of 2010 Bodega Catena Zapata Malbec Argentino High Mountain Vines [$68] from Argentina's Mendoza region. It was quite nice: juicy and concentrated, with a good base of dark fruit and oak, and stood up well against the beef. Moving on to the main courses now, we did a sort of "steak tasting," ordering up multiple cuts of the meat, and having the kitchen pre-slice 'em for us to share, similar to what I've done before at CUT. 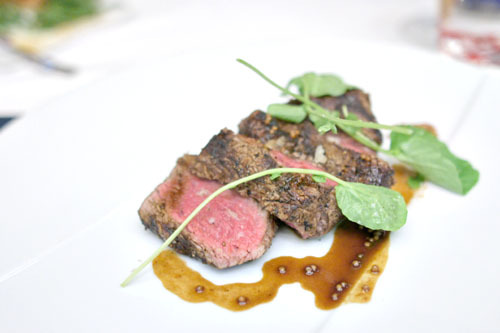 The first round featured prime steaks, advertised as dry-aged by famed butcher Pat LaFrieda back in his facilities in New York. First up was the ribeye, which was pretty amazing, the most decadent of the cuts certainly, with gobs of bovine flavor as well as fat. It was a quintessential expression of all that's wonderful about rib eye, beautifully moderated by a touch of bitterness from the crisp charring present. One of the benefits of doing a "tasting" is that you get to really compare steaks back-to-back, and that's exactly what we did. The strip steak conveyed a more balanced, more nuanced beefiness; it was far less in-your-face than the ribeye, and also showed off a lovely amount of char. Texturally, it was the firmest cut that we had, with a satisfying "crunch" to it. Last up was the filet mignon, and, not surprisingly, it was undoubtedly the most tender of the trio. The steak was super easy-to-eat, with the least amount of intramuscular fat and, of course, the mildest flavor. It was still quite delicious though, and would make a good choice for steak newbies. 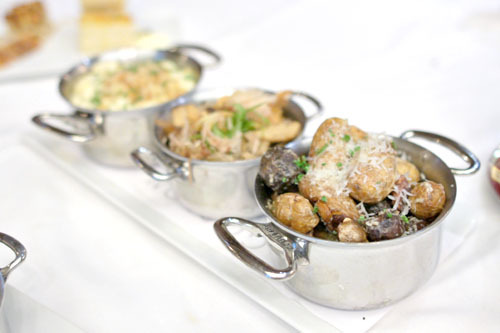 The steakhouse experience just wouldn't seem complete without a bevy of sides, and GRS certainly serves up an enviable selection. Sautéed spinach was just that, but a perfect example of the dish, with the desired astringency of the greens on proud display. The corn was also a winner, with the sweetness of the kernels vibrantly conveyed, yet deftly tempered by the tangy lime and lingering heat in the dish. It sort of reminded me of the "Chipotle Corn, Lime Butter, Queso Oaxaca" that I had at Playground down in Santa Ana. Asparagus was also quite nice: crisp and expectedly bitter, with the brightness of the spears keenly balanced by the earthy relish of chanterelle. Being quite the potato fiend, I rather enjoyed the fingerlings here, which were really a prototypical example of the roasted root vegetable, with a delightfully salty, savory smack that left me satisfied. A selection of sautéed shrooms was also nice, with the umami-rich taste of the katsuobushi sharply emphasizing the natural earthiness of the mushrooms. 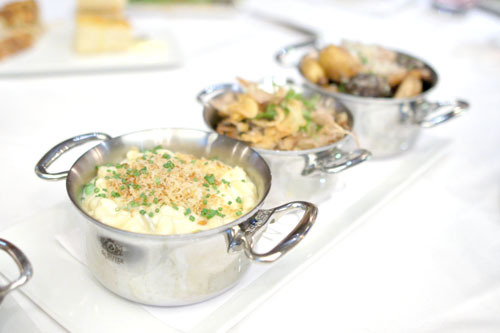 The real standout of the sides, however, was the mac 'n' cheese, which might've been the best I've ever had: perfectly textured, with a flawless harmony between the cheesiness of the dish and the heady, overarching notes of truffle--we were seriously considering ordering another round of it! 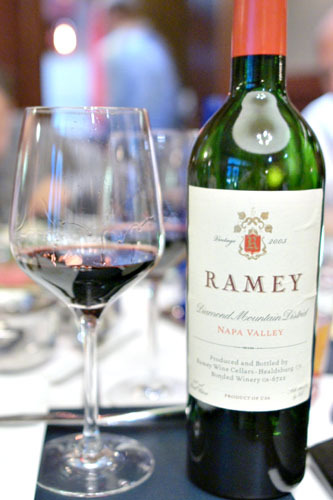 At this point, we wanted something with a bit more age and thus purchased a second bottle of red: the 2003 Ramey Cabernet Sauvignon Diamond Mountain [$170] from our very own Napa Valley. The wine was a pleasant surprise, a great expression of Cab actually: very well put together, and with everything that you'd expect. Now we tried two of the American wagyu cuts, both ostensibly with beef marbling scores of at least 9 out of 12 on the Japanese scale. First was the oft-recommended rib eye cap, which is basically a heavily marbled piece that sits on the perimeter of the steak. It was probably my favorite cut of the evening, with a uniquely silken, tender consistency and a very well-integrated amount of fat. 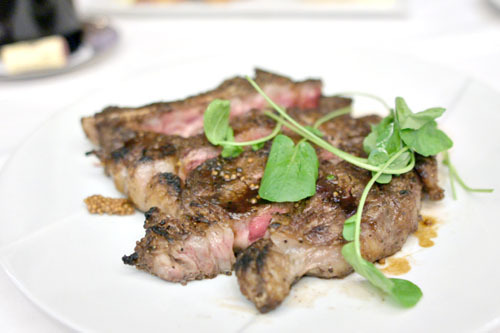 Overall, a more refined eating experience vis-à-vis the standard ribeye. This one should be at the top of your list as far as steaks go. Finally, we enjoyed our tenderloin, which, though very tasty, wasn't a night-and-day difference over the standard varietal. If you're a filet fan, there's probably not a huge advantage to going with the wagyu, as I think you'll be satisfied either way. As expected, the flavor wasn't nearly as intense as that of the preceding rib eye, but the meat was still quite delicious, and even better when taking into account the char of the steak. 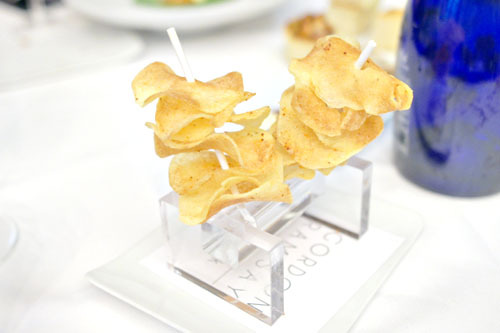 Ramsay's rendition of fish & chips was no doubt one of the strongest that I've tasted. 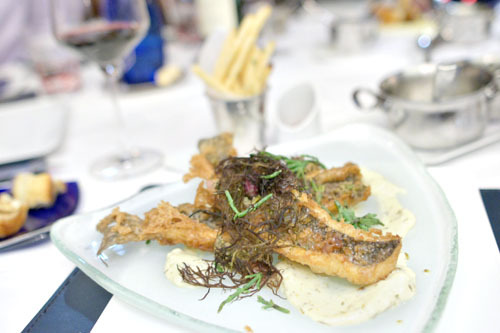 In place of the typical haddock or cod, we had instead European seabass, which I found tender and juicy, yet crisp on the outside, with a pronounced salinity that was augmented by the dish's topping of seaweed. Meanwhile, a citric component formed a fitting counterpoint to the fish, and the paired truffle fries were spot on, absolutely fantastic on their own. And now we come to the evening's pièce de résistance, really, the one dish that we were looking forward to the most. 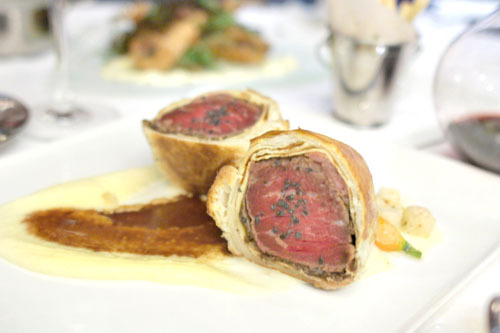 The "Welly" is oft regarded as Gordon Ramsay's signature dish, and is prominently featured on his show Hell's Kitchen. 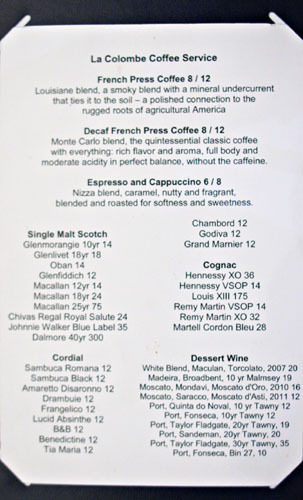 I'd actually had it before at Ramsay's West Hollywood restaurant, but was sorely disappointed. Tonight, thus, was a chance for redemption, and indeed, the iteration here was miles beyond what we'd experienced before. 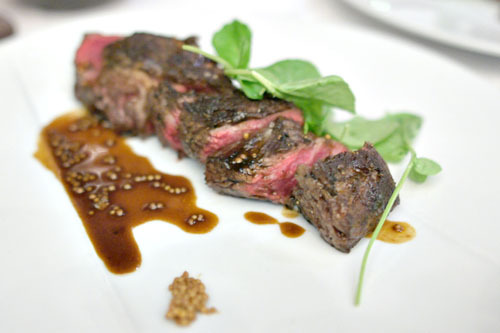 Compared to the horribly overdone version in LA, this preparation was cooked nicely rare, and showed off a satisfying beefiness that was duly enhanced by the dark, rich relish of the duxelles. The flaky crust did an admirable job moderating the hearty flavors at play, and I appreciated the levity imparted by the potato and other root veggies as well. This was basically a textbook Wellington: nothing game-changing, but certainly quite tasty. Dessert was, of course, a must, and before we had a chance to decide upon what wanted, the kitchen ended up sending out a complementary tasting of all seven items (this, after Chef Hee discovered that we had a mutual friend in the form of Marianthefoodie, who highly recommended the restaurant). Click for larger versions. 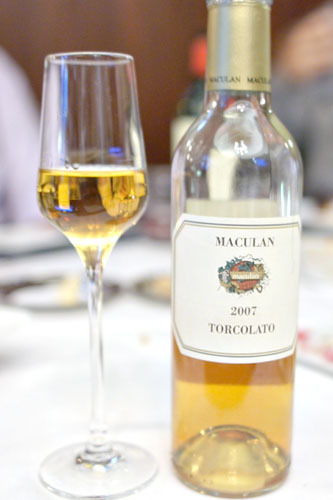 For dessert, our sommelier recommended the 2007 Maculan Torcolato [$87] from Italy's Veneto region. It's a wine that's been affected by botrytis, and apparently, is further concentrated by twisting the grapes using twine. The Maculan was all that I wanted from a dessert wine, with an almost Sauternes-esque character to it: sweet, but not overwhelmingly so, redolent of stone fruit, with a lovely brightness and counterbalancing acidity. 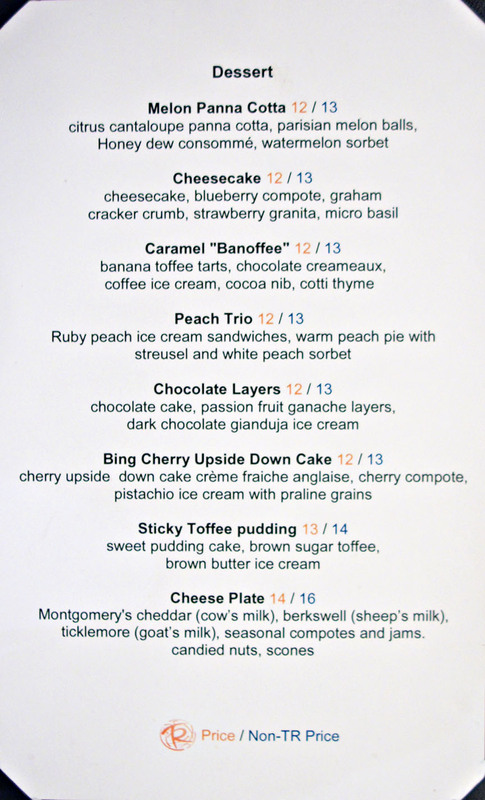 Unsurprisingly, the panna cotta was the lightest of our seven desserts, and featured the many faces of melon. It was a bright, summer-y, refreshing course, one filled with light, fruity notes, but counteracted a bit by the lactic tartness of the panna cotta. This sort of deconstructed cheesecake was definitely a highlight. When all the elements were tasted together, everything just clicked, with the tangy, creamy cake playing wonderfully off of the sugary fruit, all while the graham cracker moderated the interaction. Just beautifully integrated, with everything having its place. Next was a reimagined banoffee pie, a type of English dessert made with bananas and toffee. 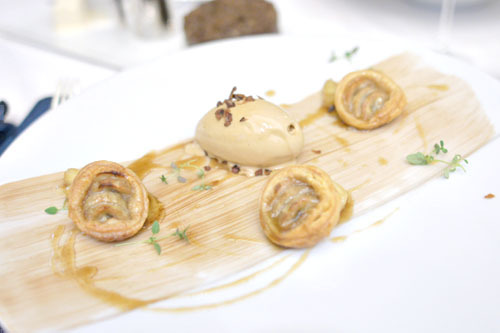 The interplay between the two components was spot on, while the coffee ice cream served as an off-sweet, somewhat bitter foil that really added a sense of balance to the dish. I'm generally not a fan of coffee desserts, but this was quite pleasing. 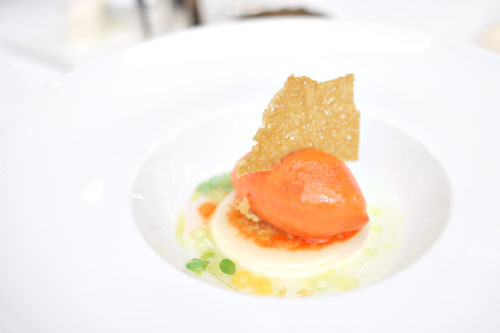 Unfortunately, with all the sampling and passing back and forth of the dishes, I forgot to try the peach dessert. My dining companions all seemed to enjoy it well enough, though. Next time! 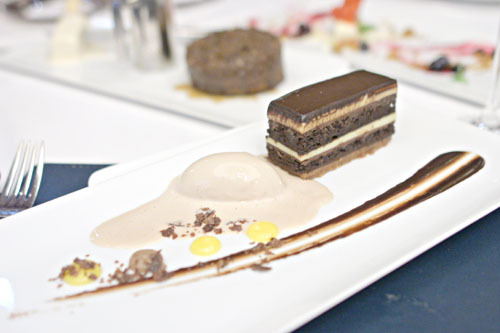 A torte-like layer cake was nice enough, adroitly playing the contrasting flavors of chocolate and tangy fruit against each other, all over a backdrop formed by the nutty gianduja ice cream. 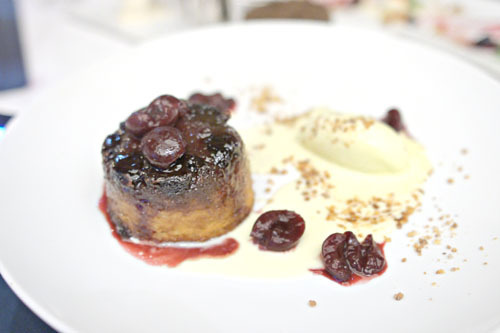 I also liked the cherry upside-down cake, which I found moist, buttery, and loaded with cherry sweetness. 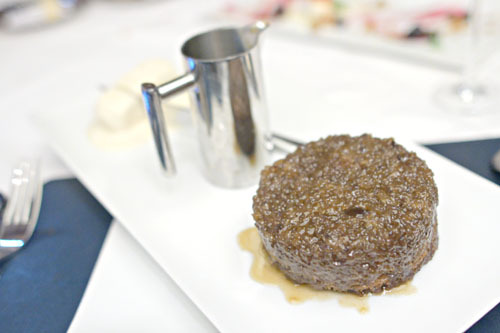 At the same time, the crème anglaise and pistachio ice cream provided a counterpoint to the cake, while the praline grains gave the dessert a wonderful nuttiness on the finish. 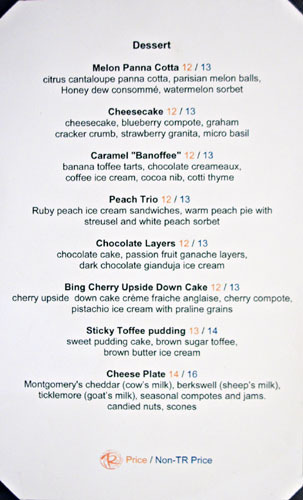 We closed with the restaurant's "signature" dessert, and it did not let us down. It was a perfect example of the traditional British dish, the best preparation that I've had, in fact. The dark, sugary, fruity flavors that I expected were all flawlessly conveyed in the dense, totally saturated cake, amplified by the drizzling of toffee, with the ice cream serving as an unflappable complement. A must try. 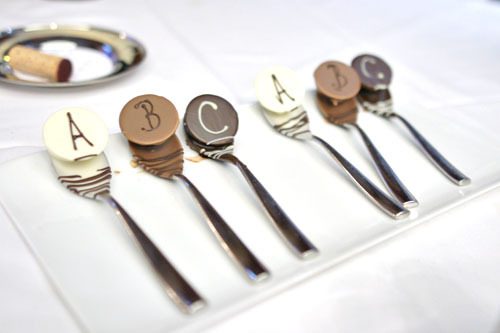 Coffee and espresso were served with whimsical chocolate cordials containing your "ABCs:" Amaretto, Baileys, and Chambord. As regular readers will know, I've never been a huge fan of Gordon Ramsay given my subpar experiences at his WeHo restaurant (which he doesn't own anymore). This meal, though, has gone a long way in restoring my faith in the notoriously mercurial chef. 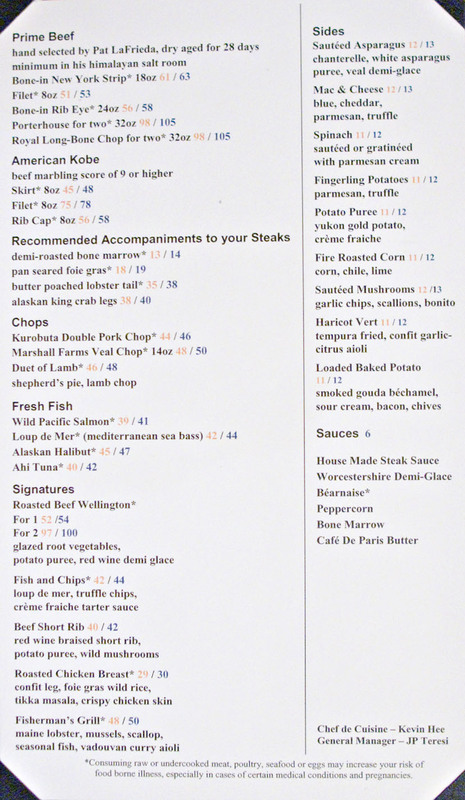 It was, in fact, a near-flawless steakhouse experience, and so far, is the only place that's rivaled CUT in my eyes. Chef Hee seems to be doing a bang-up job running the place and should be commended for his efforts, and I'm very interested to see what the kitchen will do when/if they get their hands on some real Japanese wagyu (the ban was lifted in August). Gordo, however, is not through with Vegas. He's planning to open Gordon Ramsay Pub & Grill at Caesars Palace later this year (replacing Bradley Ogden), which will then be followed up with GR Burger at Planet Hollywood. Perhaps more relevant, though, to this largely Los Angeles audience is the Fat Cow, which is slated to grand open in the coming weeks (it's already soft opened) at The Grove shopping center. 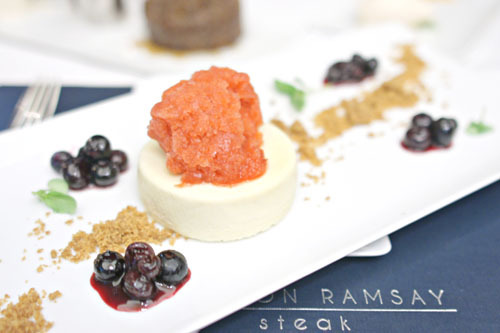 Yes, it's another gastropub (sigh), but hopefully Ramsay can bring sometime new to the table. Given the strength of this dinner, I do have fairly high hopes for the place, and with Andi Van Willigan, another Michael Mina protégée, at the helm, things should be looking good. Very surprised to see such a good report after reading your past Ramsay experiences. That was a lot of meat to get through, how many people were you dinging with? 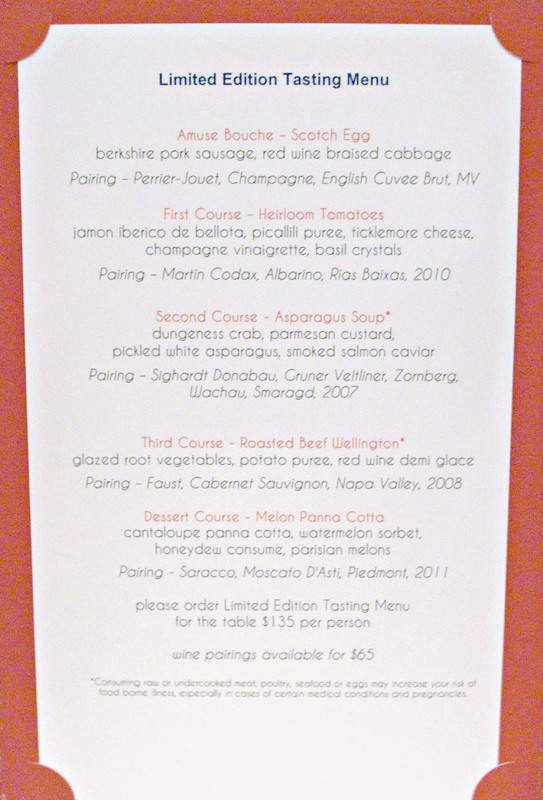 is there a reason the limited edition tasting menu is more expensive than getting those items a la carte? bigger portions? Thorough review Kevin, maybe we'll have to add this one next time we're in LV. 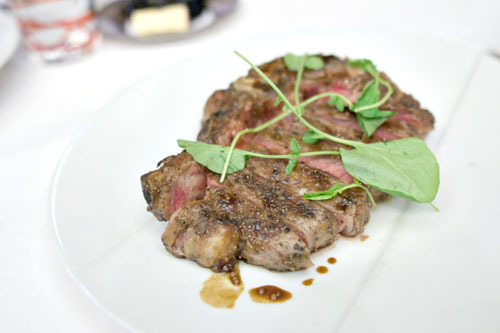 But I still want to try the riserva steak at Carnevino. Concur with the bad experiences with Gordon Ramsey. 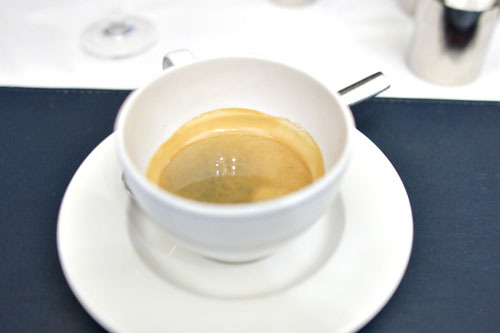 I've also had the opportunity to try his 3-star at Hospital Road and found his food bland. 1. Did you say that Ramsay himself was at the restaurant? 2. Do you ever feel that having the kitchen pre-cut the steaks are sort of cheating, in that they're able to see the done-ness of the steaks before hand? 3. 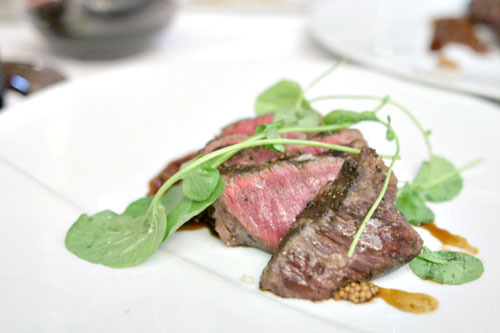 What was the process that Chef Hee went through to be selected for head chef at GR Steak? Is it Ramsay himself that has the entire say about this? Asparagus in September? Color me skeptical. I'm sorry, but those steaks look sad. There is a distinct lack of Maillard browning. Looks like they were cooked sous vide and then dropped on a not-hot-enough grill for just a few seconds in a failed attempt to brown. total agree on the mac and cheese. the best. i wish the dining room was more upscale. Sam: The way I was thinking was that given the travesty that's WeHo, Ramsay was due for a hit sometime. Jars: Sorry for the late response; how was the meal? In response to you questions: 1) He was most definitely not. 2) Normally I would, but in this case we actually requested that they do so to allow for easier sharing. 3) I don't know the exact details here, but I imagine it had to be a joint decision between the hotel and Ramsay. Remember, they were probably looking for someone with LV hotel restaurant experience, and Hee fit that bill nicely. 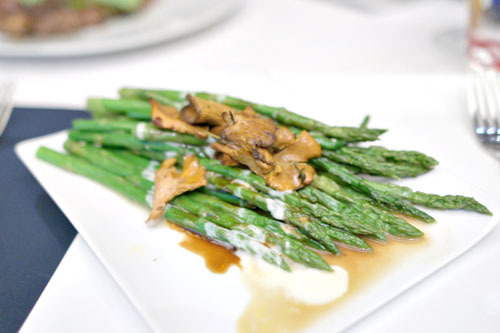 Anon: The traditional season is spring-summer, but due to the prevalence of imports from around the globe, I believe asparagus is pretty much available all year. Anon: They might not be the best looking steaks, but the flavor was there, in spades. Anon: Indeed. I think they purposely made it less upscale than the previous restaurant in order to broaden appeal to the more "touristy" crowd that GR's name is sure to attract. We finally agree on a steakhouse! This is by far my favorite steakhouse now. Glad you had a fabulous experience as well. Marian: I think you need to give CUT another try, especially if the commentor below is correct. 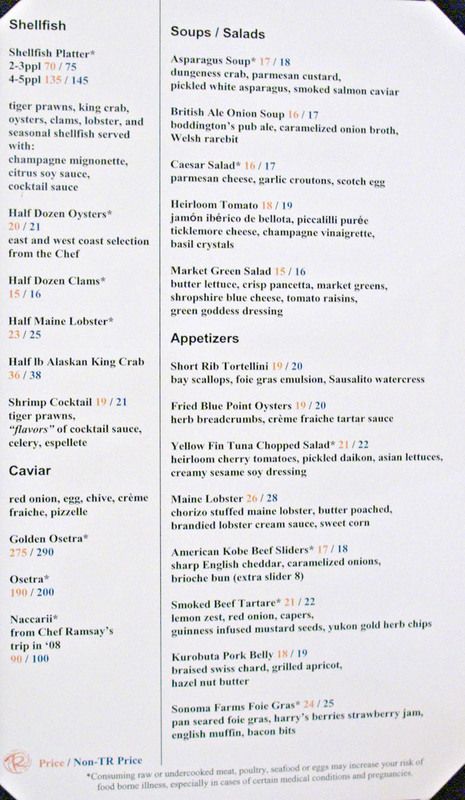 Anon: I know the Vegas outpost has the real deal Japanese now, but is it at Beverly Hills too? The menu online says no.